Whether it’s breakfast, lunch, or dinner sometimes you have to get a little creative in the way you present food to make it more appealing to your kids. I am all for making my boys happy and getting them to eat so if they want some Lightsaber Snacks that is exactly what they are going to get! Today we’ve decided to work with our friends at Tyson to share these fun snacks with you and guess what? We have ideas perfect for breakfast and lunch… May the force be with your child’s food! Start by preparing your State Fair Corn Dogs according to the directions on the box. In the meantime, you can start making your sauces. 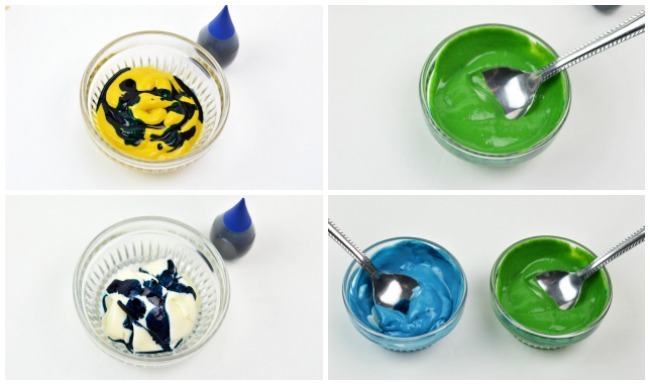 For the green color I mixed mustard with a few drops of blue food coloring. 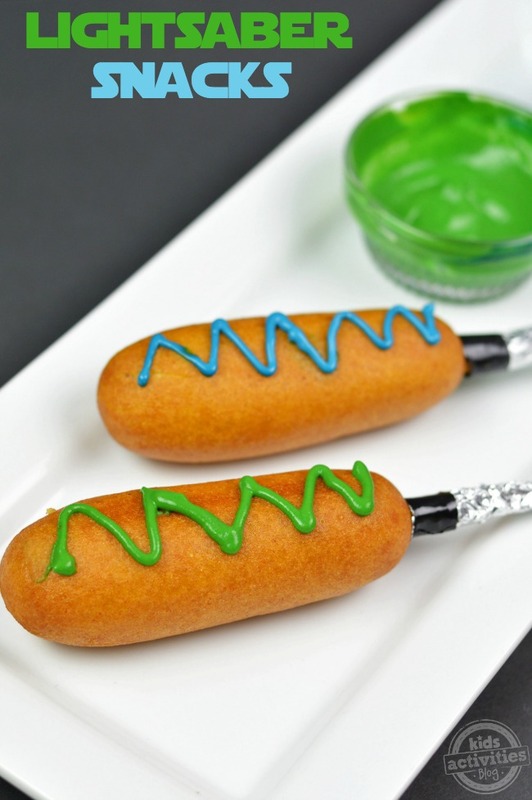 For the blue color I use mayonnaise and again used a few drops of blue food coloring. 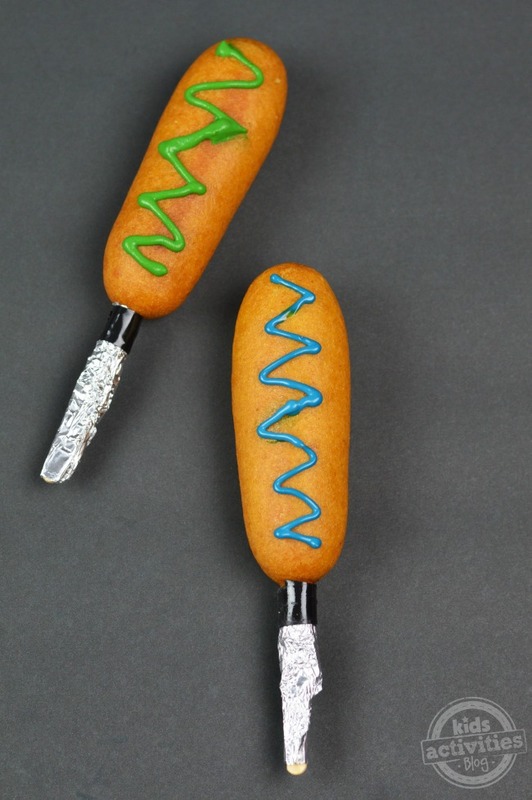 Once your corn dog is fully cooked, wrap the stick with aluminum foil. Place a small piece of black tape around the outside of the aluminum foil. This should resemble the base of a lightsaber. To make things easier you can place your sauces into some small squeeze bottles. Tip: Run the bottles under hot water to get them a little warm and it will be easier to squeeze. 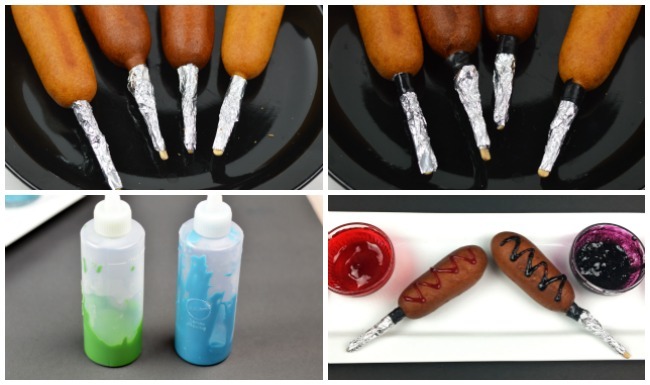 Carefully squeeze the sauces onto each corn dog. I went with a fun zig-zag pattern. 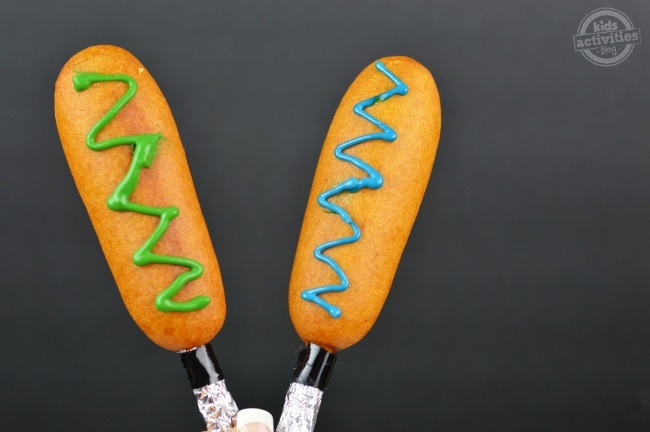 While the corn dogs are a great lunch or dinner idea, you can use the same concept for the Jimmy Dean ® Pancake and Sausage on a Stick which are perfect for breakfast! For the breakfast idea I used strawberry jelly and added a few drops of red food coloring to make a brighter red. For the purple lightsaber I used grape jelly and added a few drops of neon purple food coloring to make a brighter purple. We totally think your kids are going to love these. They will be able to play with their food and eat it too! As I mentioned before sometimes as parents we have to make meals fun for our kids. That is especially true if you have picky eaters in your home like I do. Aside from making meals fun sometimes I also need a quick meal idea. As a work-from-home mom I am on a tight schedule and some days are worst than others. 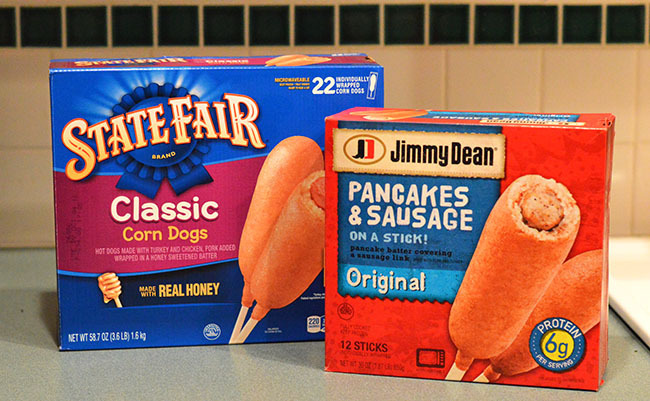 Having quick and easy meal solutions is a must which is why I totally love the Jimmy Dean ® Pancake and Sausage on a Stick and State Fair Corn Dogs. With these two products I know my kids can enjoy a delicious meal and I can rest knowing it can be made quickly and easily. Plus, both are a great source of protein and can be the perfect on-the-go snack. I found both of these products at my local Walmart in the frozen isle. They are available in 12 – 22 count varieties. So what do you think? Is this a snack/meal your kids will enjoy? This is a sponsored conversation written by me on behalf of Tyson ®. The opinions and text are all mine.